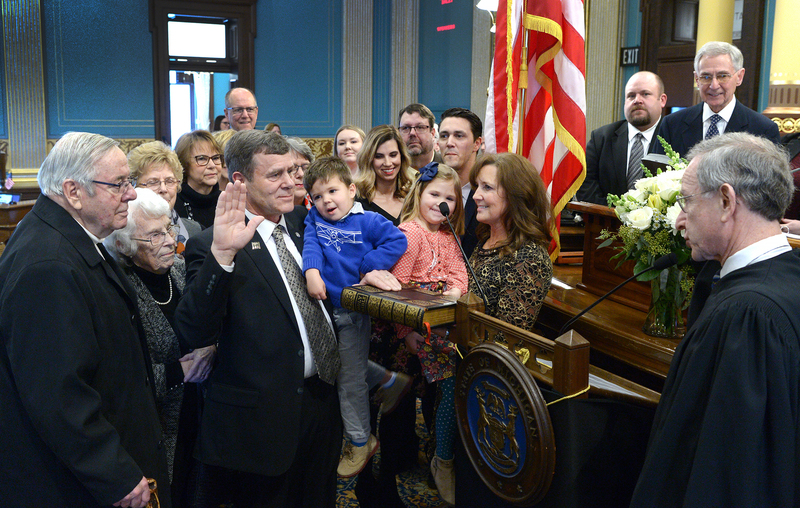 LANSING, Mich. — State Sen. KevinDaley was sworn in for his first term as a state senator representing the 31st District on Wednesday during a ceremony at the state Capitol. Michigan Supreme Court Chief Justice Stephen J. Markman administered the oath of office. Editor’s note:A print-quality version of the above photograph is available by clicking on the image or by visiting the senator’s website at www.SenatorKevinDaley.com. Click on “Photos” under the “In the News” tab. Photo caption: State Sen. KevinDaley, R-Lum, was joined by his wife Debbie and members of his family during Wednesday’s swearing-in ceremony at the state Capitol in Lansing.